Mmusi Maimane, leader of the Democratic Alliance, South Africa's official opposition party. Cape Town — The Democratic Alliance and its leader Mmusi Maimane have taken it upon themselves to play a part in resolving Zimbabwe's current crisis by pushing for foreign intervention. But the Zimbabwean government seems to be having none of that. Mnangagwa's spokesperson George Charamba said that Zimbabwe's government has no interest in engaging with Maimane. Maimane also said he would approach the UN, the International Criminal Court (ICC) and South Africa's parliament over the crisis in Zimbabwe - but President Emmerson Mnangagwa's government responded by saying the DA leader was "playing to the gallery". "If Maimane tries to come here he will be thrown out and will not be allowed to come into the country. We are a sovereign state and not a banana republic," said Charamba. The Herald, a state-owned daily newspaper, has dismissed Maimane, referring to his efforts as "Maimane's attention-seeking behaviour". In the article titled 'Unpacking Maimane's Monkey Tricks', Runyanga goes through the DA leader's political journey, in a brutal manner. "In South Africa he is known for his poor attempts to sound and look like former South African president, the late Nelson Mandela, and former American president Barack Obama," Nobleman Runyanga writes for The Herald. 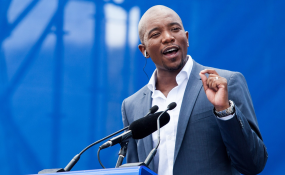 Apart from calling Maimane out as an impersonator, the article alleges that although he is the leader of South Africa's main opposition party, Maimane is not in charge of the party he supposedly leads. "It turned out that, despite being the party president, power was vested in the original members of the white community. Nowhere did this play out more clearly than when in 2017, the party's immediate past leader and Eastern Cape Premier, Helen Zille, tweeted that some aspects of apartheid continued to benefit the country, to the chagrin of most South Africans. South Africans, especially black ones, expected Maimane to discipline Zille but this proved to be a tall order." Maimane has been pushing President Cyril Ramaphosa to intervene, accusing him of "sitting on his hands" and refusing to take action while assault, torture, inhumane and degrading treatment of citizens continued in the neighbouring Zimbabwe. On January 31, Maimane revealed that he had requested a meeting with Mnangagwa about the violent police response towards protesting Zimbabweans. Maimane said he was intervening on behalf of the Southern African Partnership for Democratic Change, which is a group comprising opposition parties in the SADC region, since "both the African Union and the SADC had failed to make any meaningful intervention". "The purpose of this visit is to seek practical solutions to the ongoing crisis and garner support across the region for much-needed intervention in Zimbabwe," Maimane said. It seems that Maimane hit a raw nerve when he said he would approach the ICC, but around the same time, an ANC delegation was in Harare to meet their Zanu-PF counterparts. Led by ANC Secretary-General Ace Magashule, the delegation included senior ANC officials Tony Yengeni, Thoko Didiza and Bongani Nongo. The delegation held meetings with President Emmerson Mnangagwa and his deputies Constantino Chiwenga and Kembo Mohadi. Maimane then lambasted the delegation for turning a blind eye to the "calls of civil society, opposition and Zimbabweans in general who are crying for help". "The ANC has met only with Zanu-PF. We are of the view that this is old alliances of the liberation movements. We must now stand firmly with the whole of Zimbabwe and ensure that democracy is strong," said Maimane. He was bluntly told to keep himself out of the current crisis in Zimbabwe, by the country's ambassador to South Africa Mphakama Mbete but Maimane vowed to continue with his "quest" to save Zimbabwe, while the current South African president had responded by calling on the international community to lift sanctions.